Smithsonian Institution is the research and museum complex which located in Washington D.C. the capital city of the U.S.A. National Museum of Natural History (NMNH) is one of the most popular places in Smithsonian Institution. NMNH is situated at the center of the city and easy to access by the subway and city bus. From Ronald Reagan National Airport it takes only about 30 minutes to get to the museum. NMMH opens every day except Christmas (December 25). The museum hour is 10:00 to 17:30, but it may change seasonally. Please check the URL below. 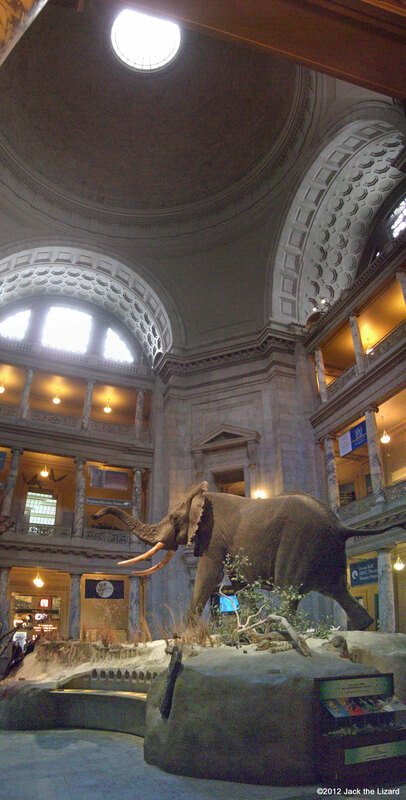 NMNH is divided into several halls such as the hall of mammals, insects and geology. 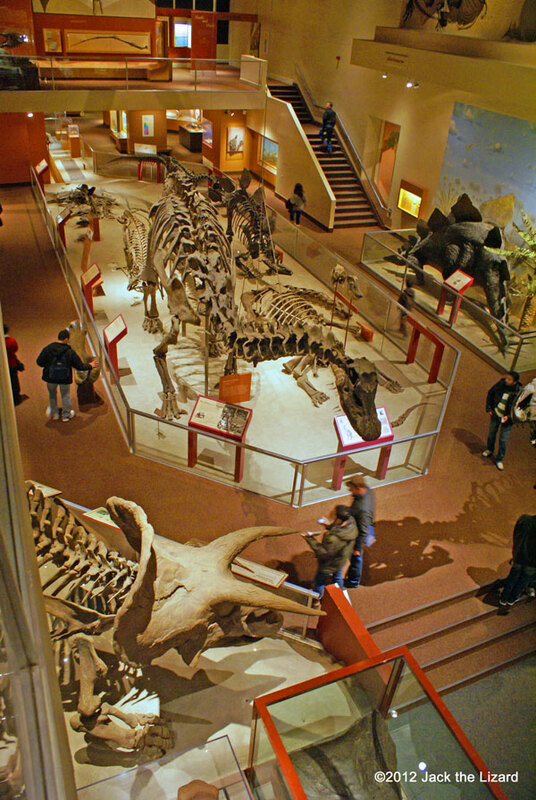 The hall of Paleobiology is found at the first floor. One of the feature displays is the exhibit of Burgess Shale in which the soft parts of the fossils are well preserved. 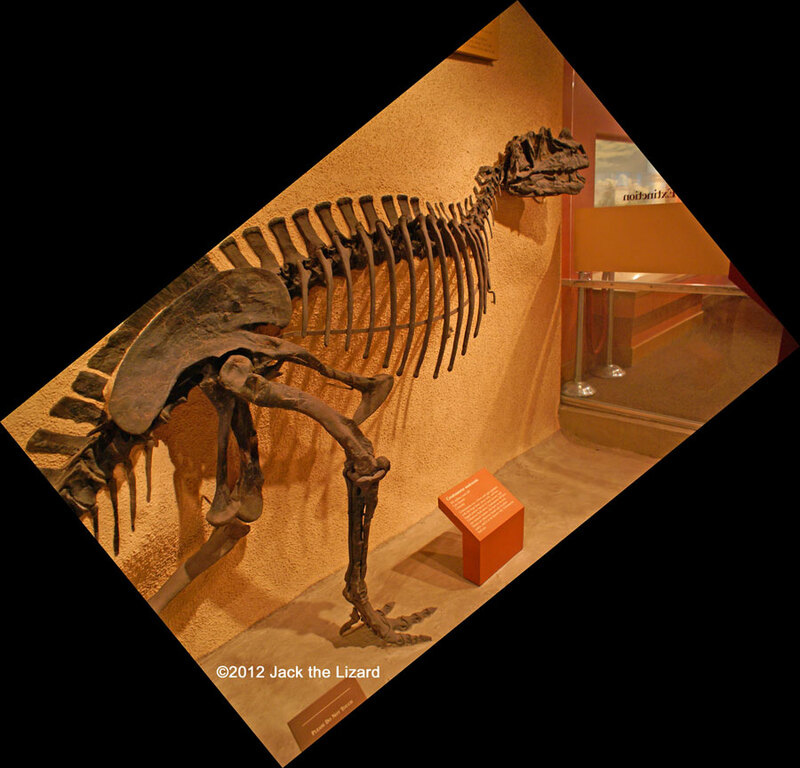 Also from Paleozoic to Cenozoic Era scientifically important fossils are displayed. Not only the fossils of ground animals are in the collections but also those of ocean animals are significant. 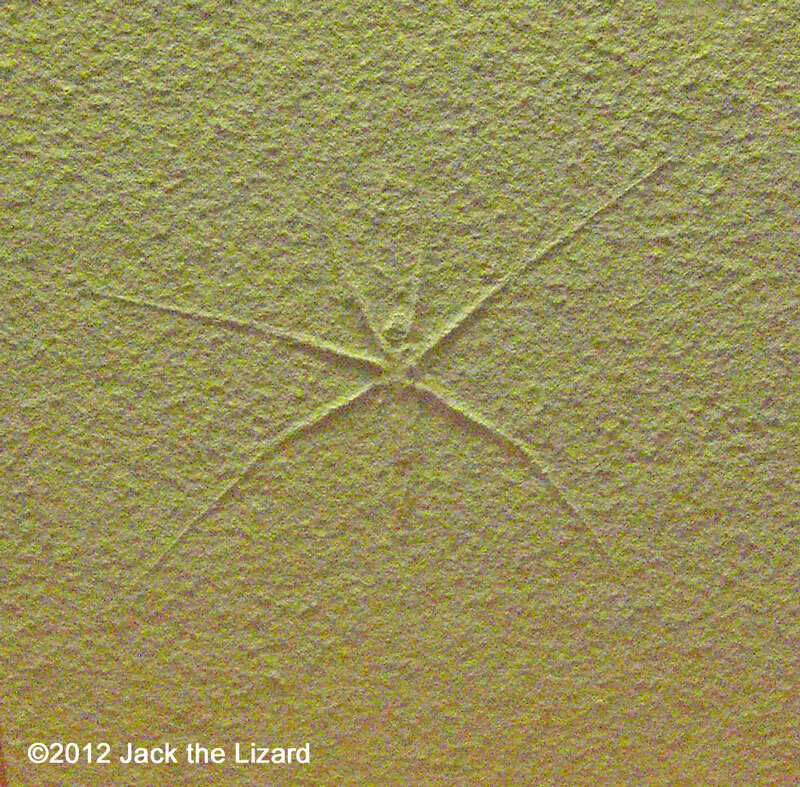 Since each specimen is well preserved, you could observe the details of its beautiful forms. 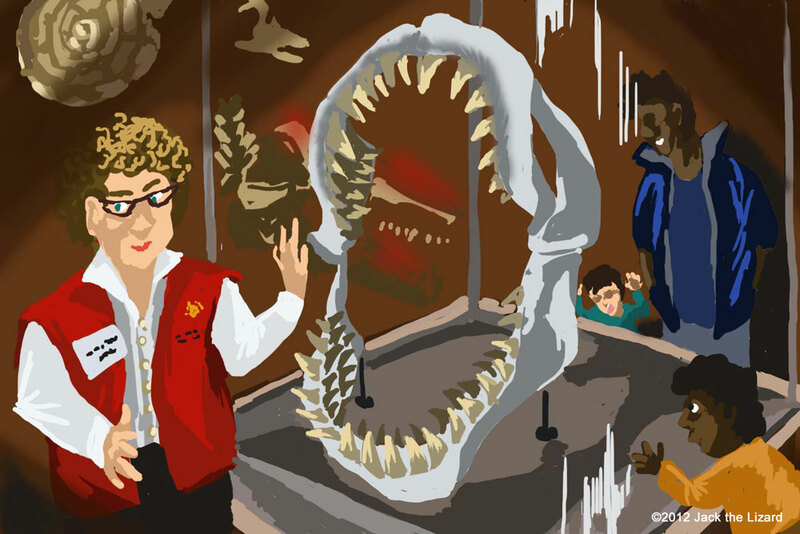 This article focuses on the collection of animals such as reptiles, dinosaurs and large mammals from Paleozoic to Cenozoic Era. Volunteers in red vest help and give some information on the displays. This is the giant jaw of Megalodon (cast). Eurypterids were the arthropods which were the first animals had landed on, but only they stayed on the land for short period of time. 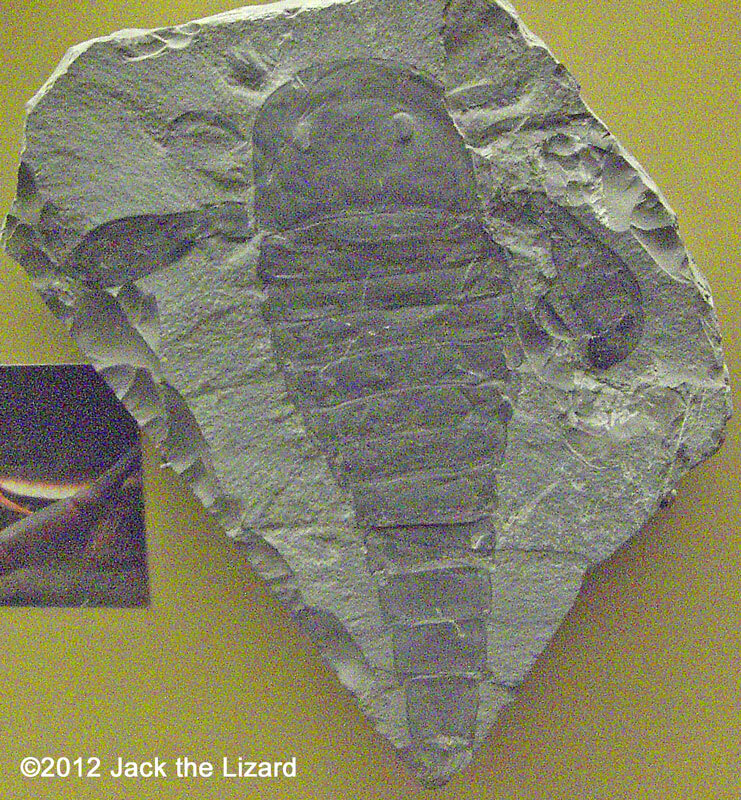 Eurypterids had gone extinct during the Great Permian Mass Extinction, 250 million years ago. Lystrosaurus were one of the first vertebrates which inhabited on the land. 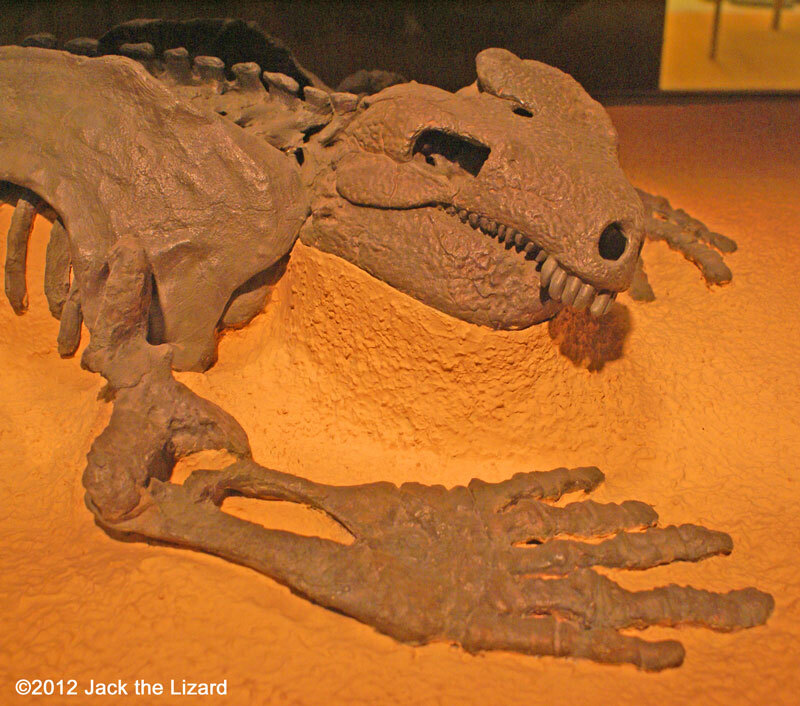 They were mammal－like reptiles lived during the late Permian, about 230-225 million years ago. 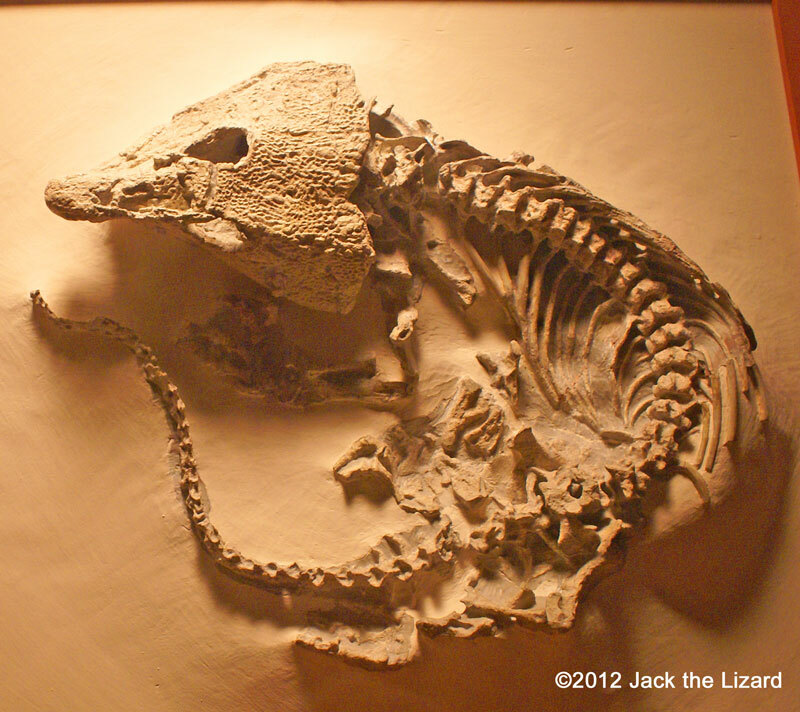 Lystrosaurus had beaked jaws which are similar to the turtles’ and lived from dry land to aquatic area, like turtles do. They were plant eater and probably primary food for the predator living during the same period of time. Edaphosaurus share the land with Labidosaurus during the Early Permian Period, about 280 - 250million years ago. Probably Edaphosaurus could not swallow large prey because they had relatively small heads, jaws and teeth. They mainly had eaten plants and might have had insects too. 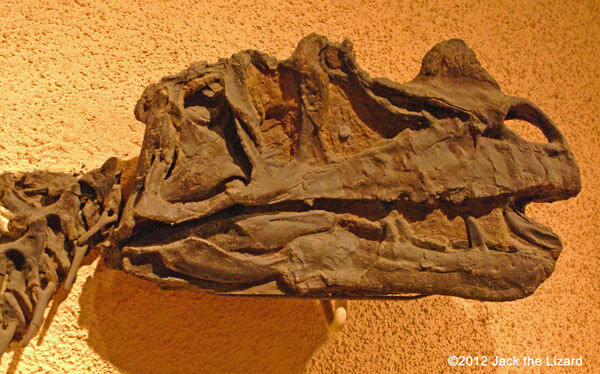 Labidosaurus belongs to the family of stem reptiles, which are very close to the earliest reptile family. Most reptilian teeth are conic and show little sign of wearing out because they replaced fast. 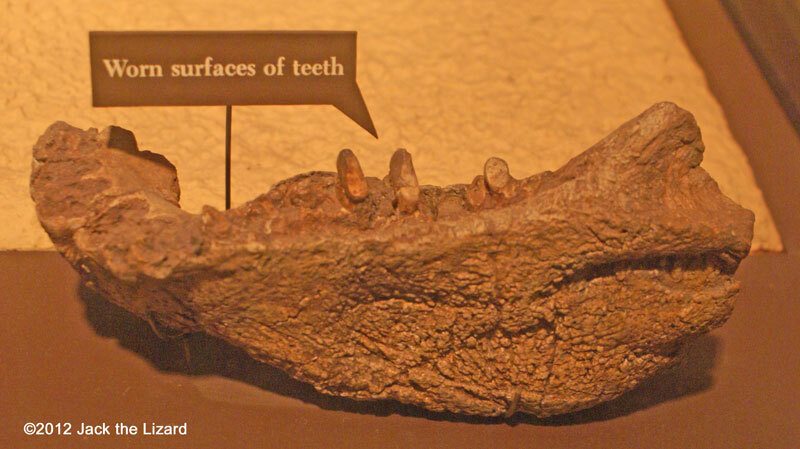 The teeth of Labidosaurus have same features of reptiles’. 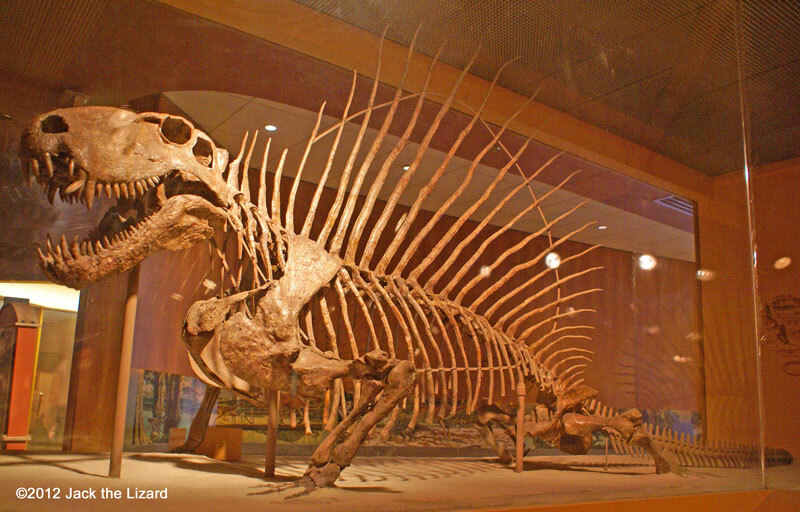 Dimetrodon was fearsome predator which lived during the Early Permian Period. S-shaped lower jaw could store the large fangs in its mouth. Probably any land animals of the time were food for Dimetrodon. 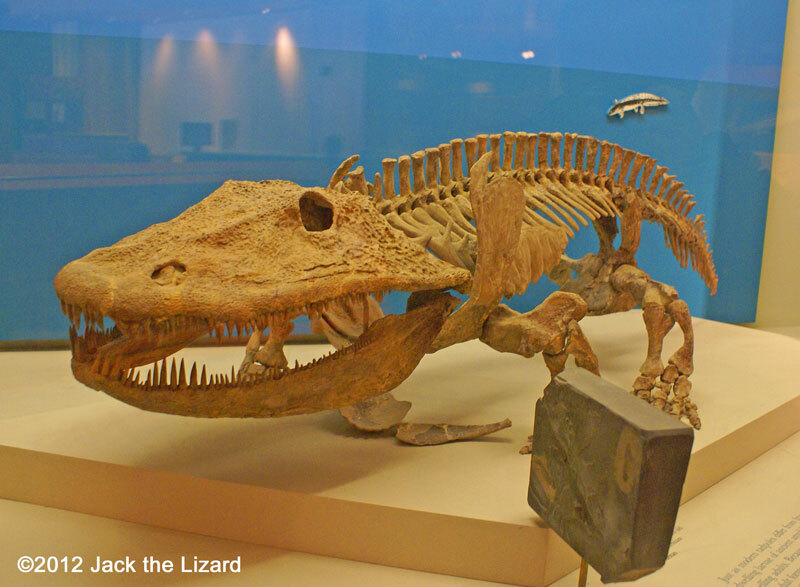 Diadectes had the body similar to reptiles despite the fact that its skull surface and the structure of its ears resemble the ones of the contemporary amphibian Seymouria. This strange creature lived during the Early Permian Period. Its teeth are different from those of either reptiles or amphibians. They are covered with enamel and certainly replaced slowly, because they were not wore out much. Diadectes was perhaps one of the few animals inhabiting the land and eating plants during its time. Same as tadpoles change themselves into frogs, the larvae of ancient amphibians also live in the water and transform themselves later for their adult life on the land. Anatomical differences often lead the misunderstanding that the larvae and the adult stages of the ancient amphibians are two different species. 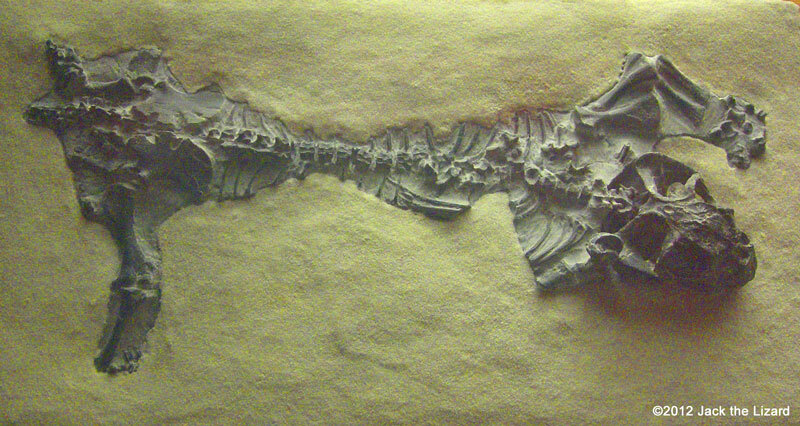 Seymouria was about 3ft (90cm) and dwelled on the land during the Early Permian Period, around 260 million years ago. Just like other land animals in those days, Seymouria had hefty legs, short body and tail to resist gravity and maneuver itself on the ground. Why reptiles in hollow tree stump? During the Late Carboniferous many of the earliest reptiles lived in shrubbery forest in Nova Scotia, Eastern Canada. Nova Scotia had periodical flood then, and many scale trees were killed by flood. Only stamps and part of trunks were remained after the flood. Then new forest recovered, but each flood made those trunks and stumps decayed after all and left deep holes in the new forest floor. Many reptiles and other land-dwelling animals fell into those natural traps in the new forest. That is why most fossils of the earliest reptiles are found in these holes. 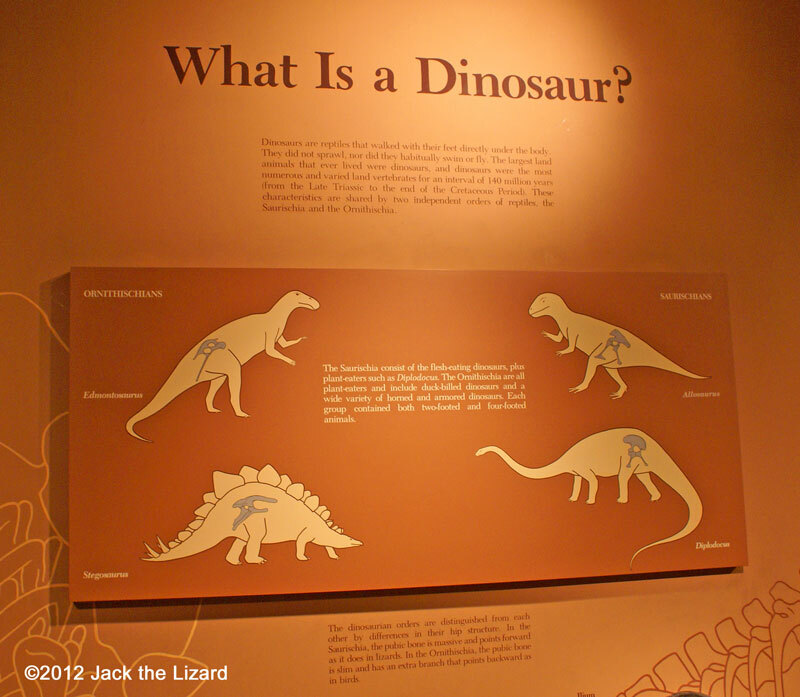 Although dinosaurs are reptiles, there are anatomical difference between dinosaurs and reptiles. Dinosaurs had their feet directly under the body, on the other hand reptiles have them side. Dinosaurs neither could swim frequently nor fly and they did not stretch out either. Dinosaurs were the largest animals that lived on the land so far. They were also most diversified and numerous land vertebrates from the Late Triassic to the end of the Cretaceous Period, for a time of about 140 million years. Two types of dinosaurs are existed, the Saurischia and the Omithischia. The Saurischia divided into two groups of dinosaurs, plant－eaters such as Diplodocus and meat-eaters such as Allosaurus. On the other hand the Omithischia are all plant-eaters such as Hadrosaurus (duck-billed dinosaurs). They were dinosaurs with varied horns and the others were with heavily armor. 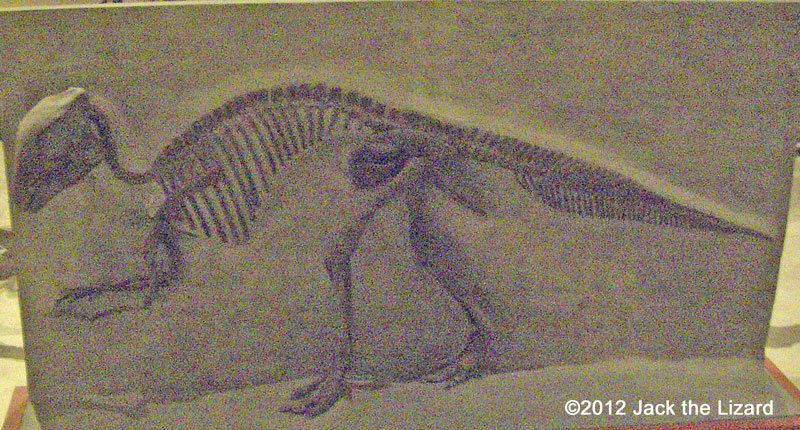 Both groups, the Saurischia and the Omithischia, included dinosaurs walking with two legs or four. Dinosaurs and birds have common distinctive features excluding the size. 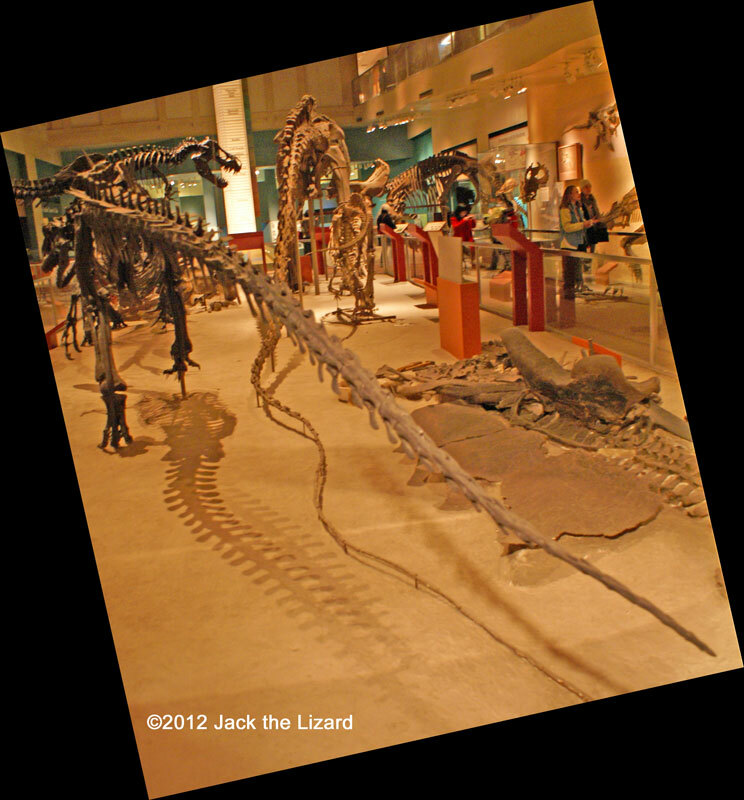 Dinosaur bones, especially the small types, were usually empty. Analyzing fossil foot prints indicates that many dinosaurs, as most birds, used their hind legs for walking and sustained their weight primarily on three toes. From inferring the narrowness of the trackways, the hind legs of dinosaurs, like those of birds, must have been attached vertically to their body, while other reptiles crawled on the ground with the legs splayed out to the side. Despite all similarity between dinosaurs and birds, dinosaurs could never fly like birds. 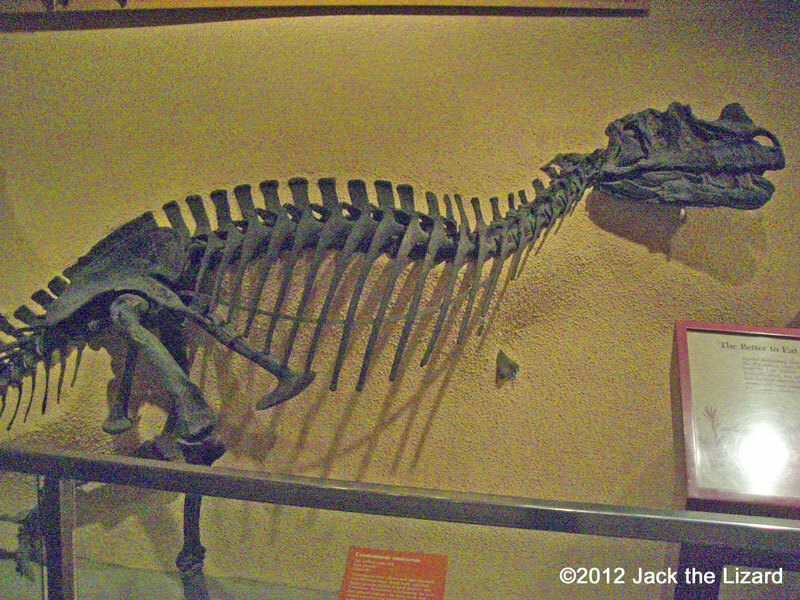 The first dinosaur in the U.S.A. The history of NMNH has begun since 1846, the year the Smithsonian Institution was founded in. 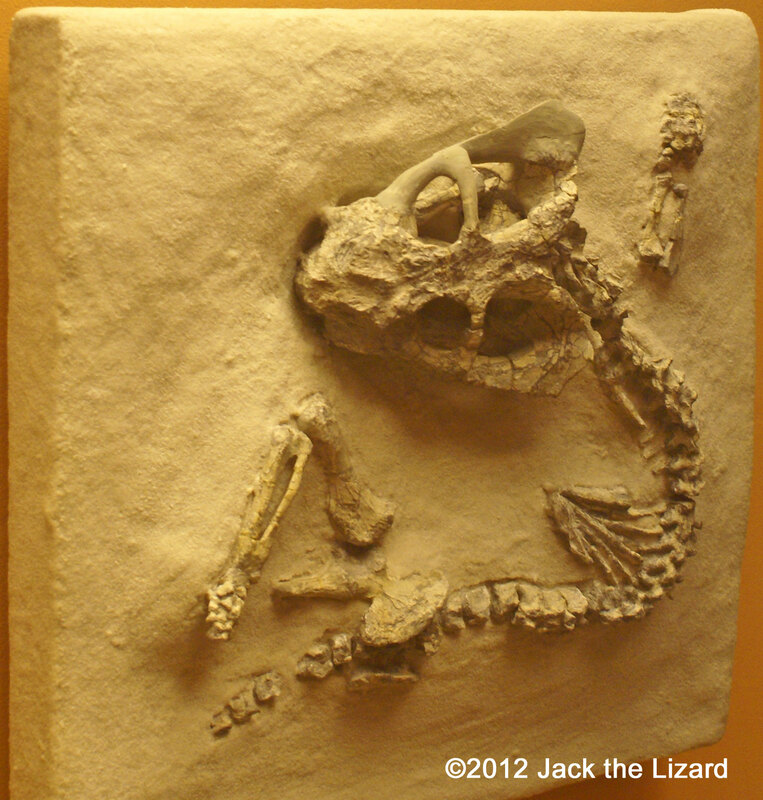 Previous to1870 the Smithsonian collected many vertebrate fossils and sent them to Dr. Joseph Leidy in Philadelphia to describe. 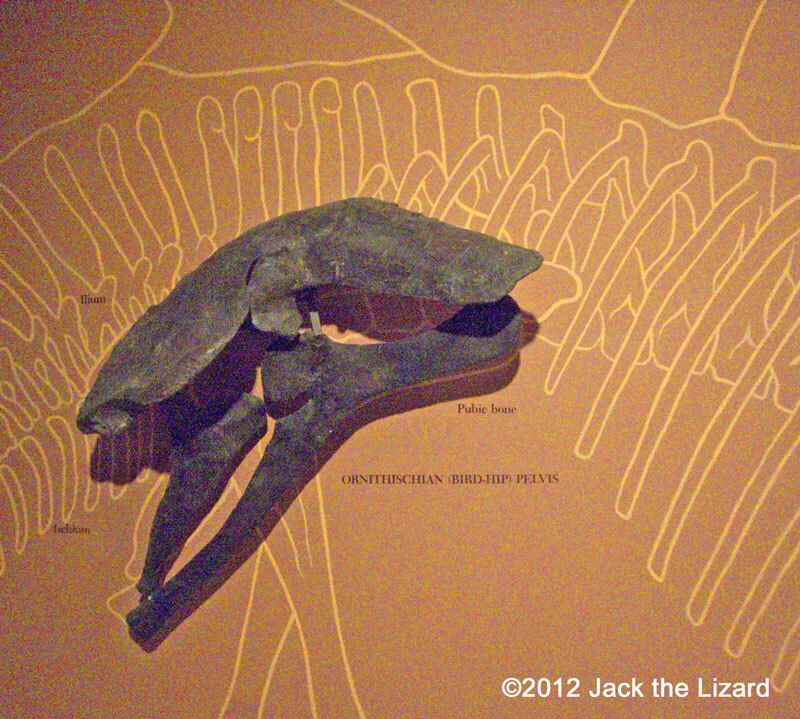 Dr. Leidy is regarded as the father of American vertebrate Paleontology for the U.S.A. 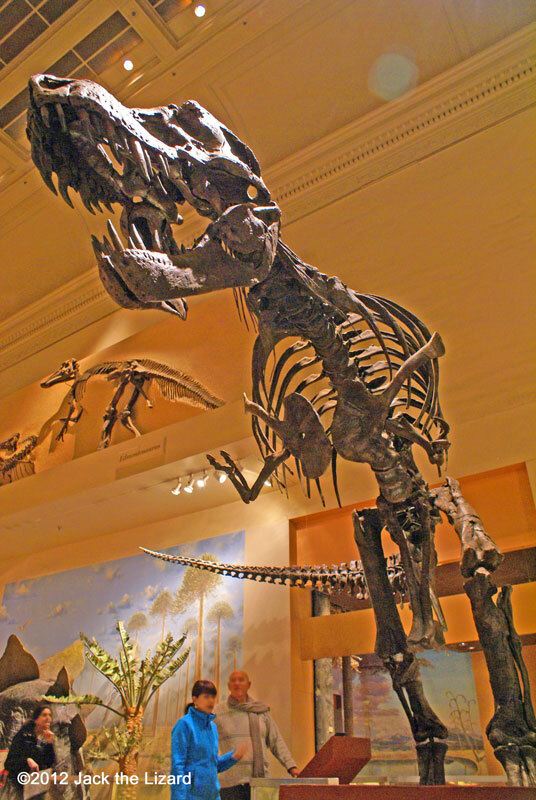 He had found the first dinosaur skeleton (Hadrosaurus) in the U.S. NMNH was opened to the public in 1910. Allosaurus was a carnivorous dinosaur that had strong jaws and sharp teeth, lived during the Late Jurassic Period, about 150-140 million years ago. The large size dinosaur such as stegosaurus could be fallen into prey for Allosaurus. This fossil tells that the shoulder blade was broken and cured later. 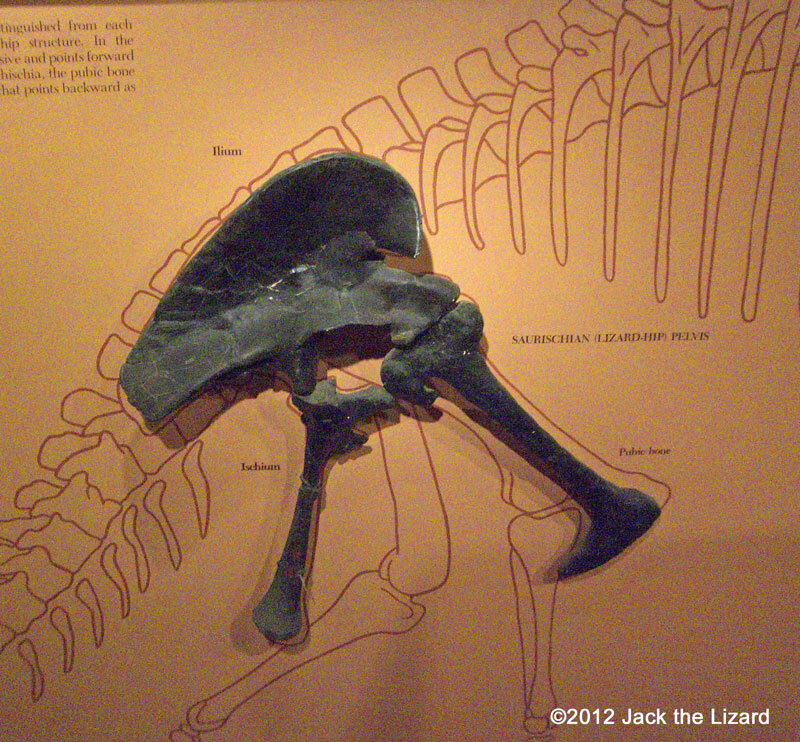 The left arm of this Allosaurus might be difficult to move because of this injury. 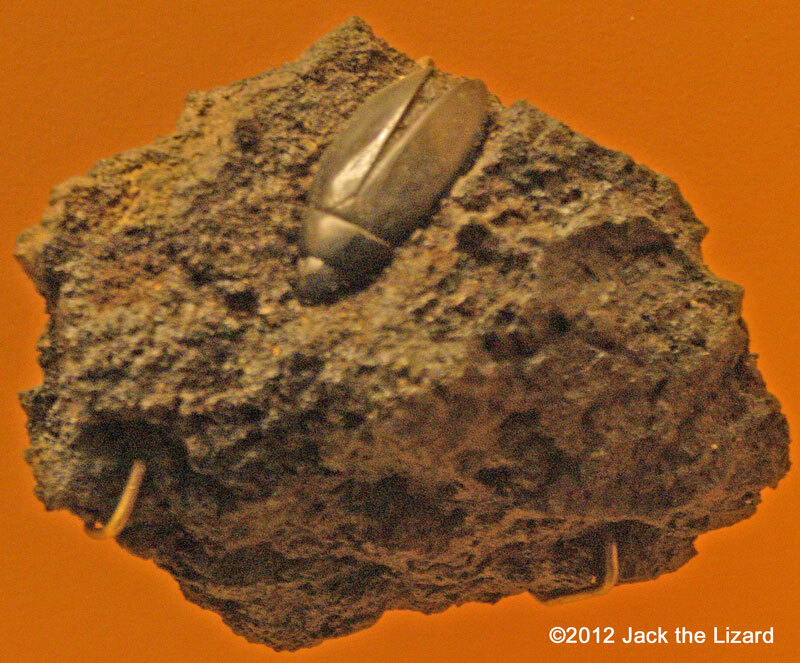 Many of invertebrates also coexisted with vertebrates and plants during the Late Jurassic Period. 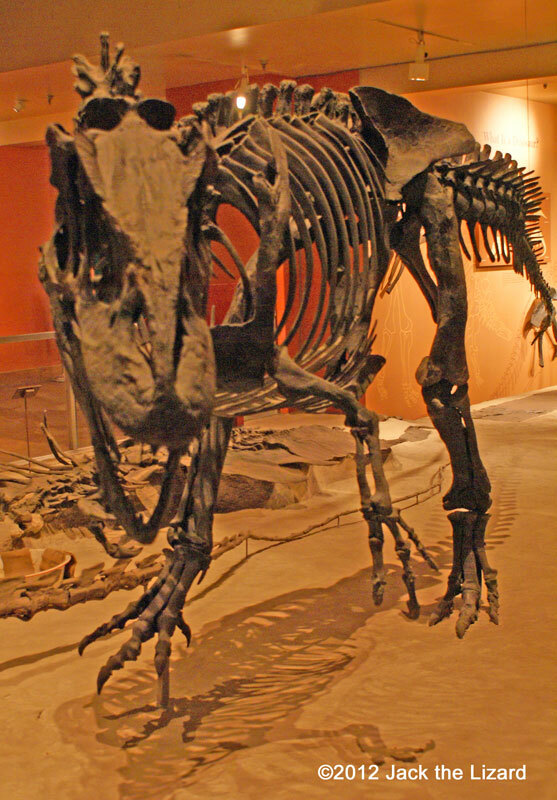 The fossils of Ceratosaurus are rare. Most Jurassic and Cretaceous predator had the typical body features such as large heads, sharp teeth, and two-footed stance. Ceratosaurus was a fearful and lightsome predator with those features, but it also had one unique feature, nose horn. Some herbivorous dinosaurs had some but carnivores. It is still unknown why Ceratosaurus had one. The size of head is one tenth of adult’s. Maiasaura brought up its young in its colony. 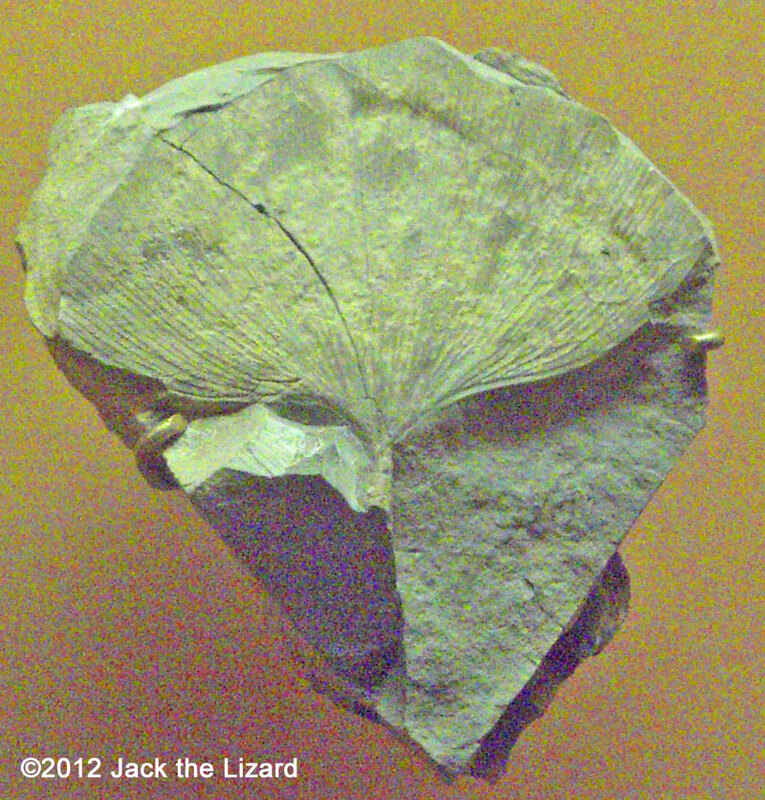 When Charles Darwin invented the term “living fossil”, he was mentioning the ginkgo. 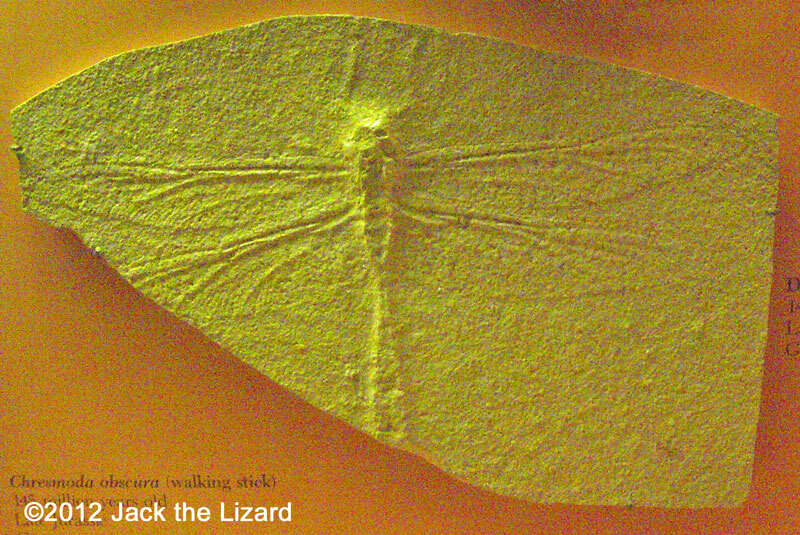 The origin of ginkgo which still thrives now dates back to the Late Carboniferous, 290 million years old. Tyrannosaurus rex means king of the Tyrant Reptiles. When T.rex dominated the land of western North America, the climate was warm and many insects were buzzing and flowers were scenting in the forest. The teeth of T.rex were large, thick, and strong enough to hold a large chunk of meat and crush bones. Even enormous Triceratops could be devoured by them. The feet and ankles of T.rex were strong and sturdy to stabilize its body when it was running over rugged ground. They could also hold on to the prey quite firmly when T.rex bit off large flesh. 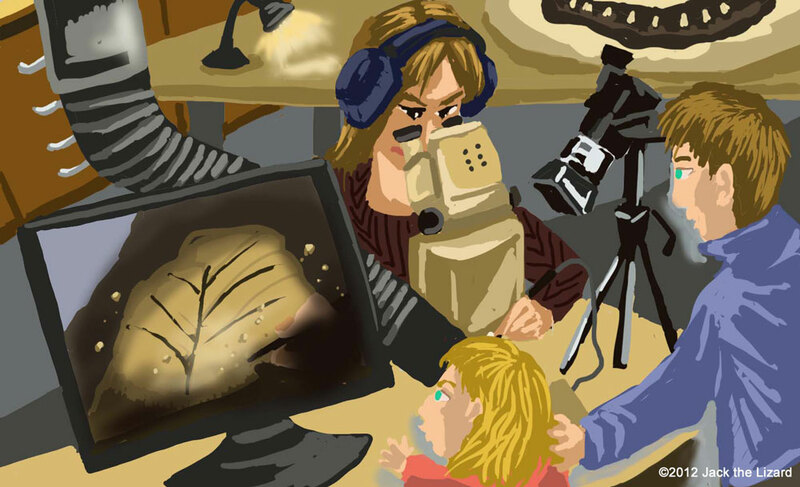 Visitors can observe the Fossil Lab while researchers take a fossil out of the rock. After the disappearance of dinosaurs, both birds and mammals began to evolve themselves to take the place of dinosaurs. 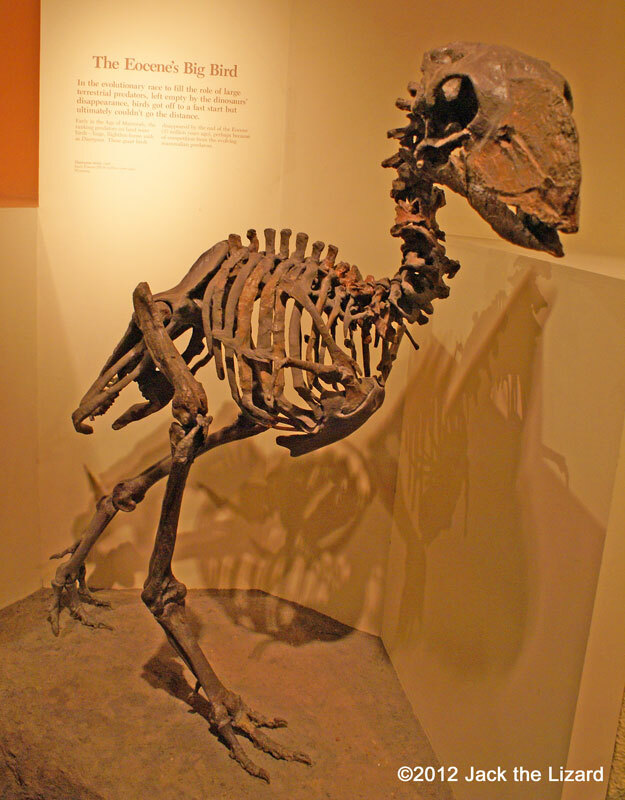 Especially large birds such as flightless Diatryma were front runners as meat eating animals. However these huge birds also gone extinct by the end of the Eocene, 37 million years ago, presumably they lost competition with mammalian predator. 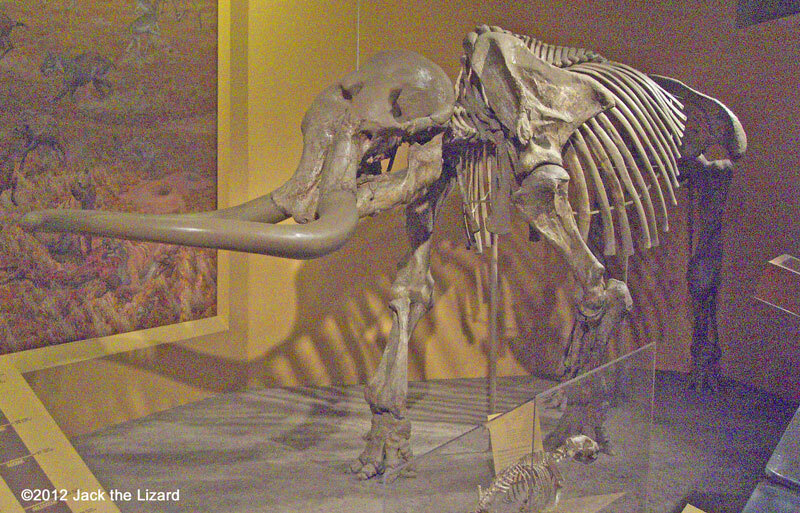 Stegomastodon was closely relative of mastodons and distantly related to mammoths and living elephants. Stegomastodon migrated from Asia to North America and South America. 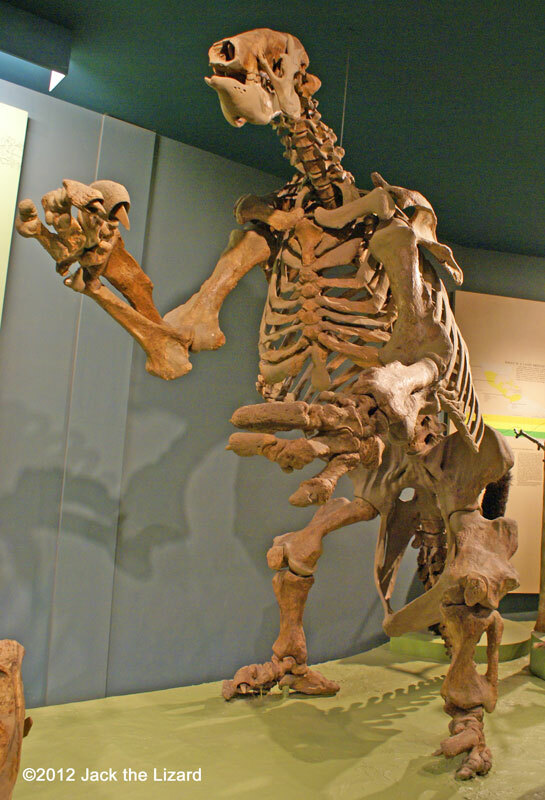 These Gigantic ground sloths were 20ft (6m) tall in an upright position and several tonnes in weight. They were probably awkward and sluggish herbivores used their tails as brace when they rose up themselves to reach sprigs and leaves. Their toes and claws were curving inside and their feet arced like bow shape to support enormous weight. Three Ground Sloth families, Megatheres, Mylodonts and Megalonychids, were originated in South America. 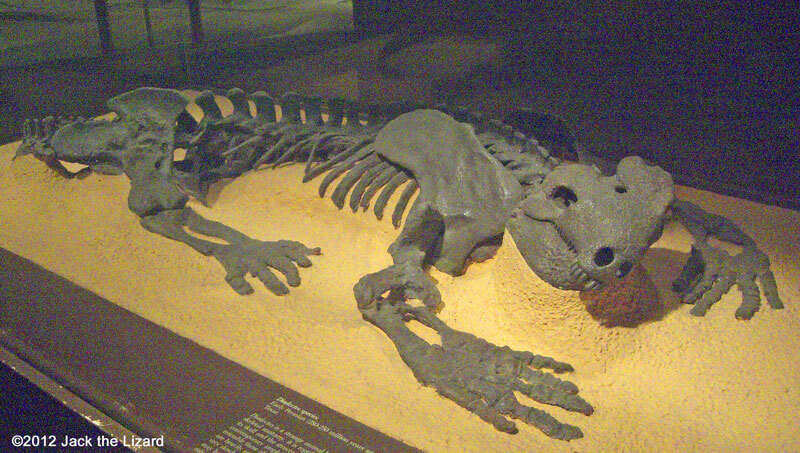 Later Ground Sloths extended their range to North America. Some of them rafted to the West Indies and others migrated through the Central American Land Bridge. Edentates means toothless and this group included Sloth and Armadillo. Ancestor of edentates is unknown, but it probably lived in South America and later branch out several species such as sloths and anteaters. Since Ground Sloths and glyptodonts spread to North America after formation of the Central American Land Bridge in the Late Pliocene, it could avoid direct competition with them to survive. During the Late Pliocene Glyptodont moved into North America through the Central America Land Bridge and occupied the southern half of North America. 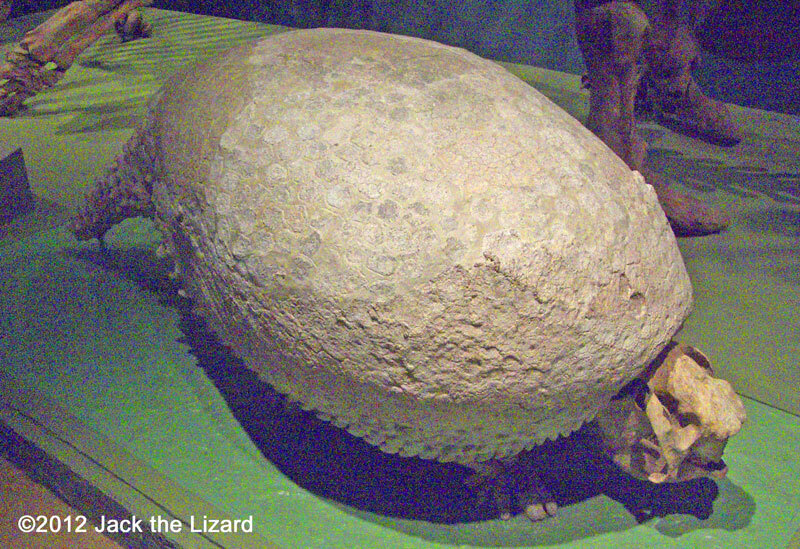 Glyptodont was a large solid vertebrate, while it had a carapace just like turtles, of which feet were like huge stems to support its massive armor. Despite their appearance Glyptodonts were probably gentle plant eaters with grinding teeth. Their habitat was warm and humid area with dense vegetation. About 2300 years ago they disappeared from the Earth because of environmental change. 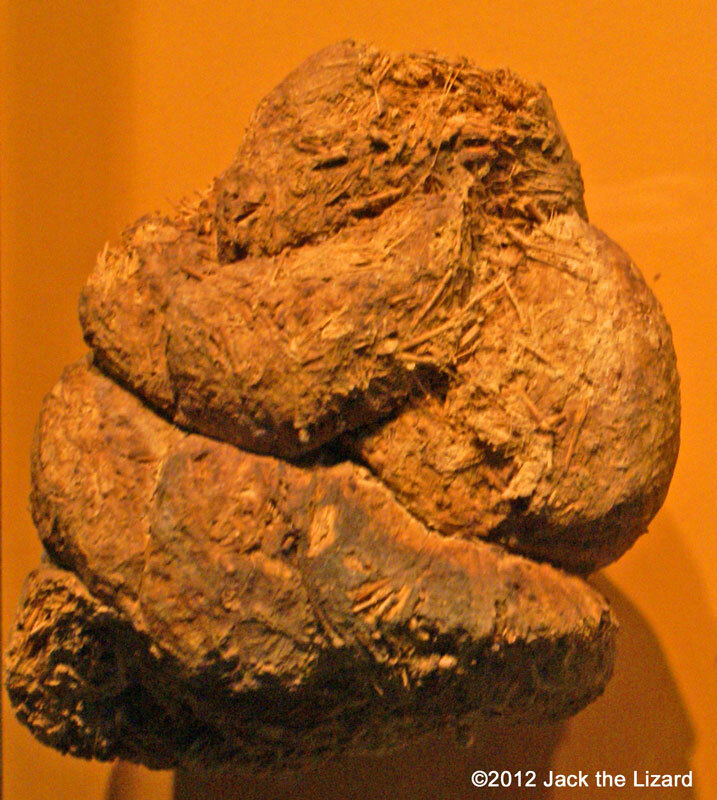 From time to time animal feces are mummified or mineralized and tell us what they ate. 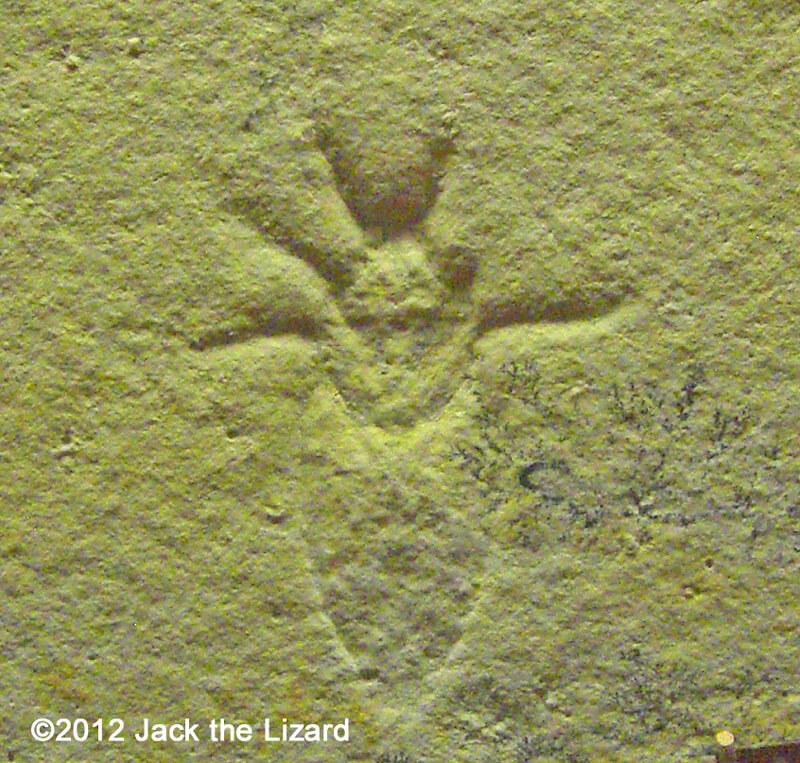 Sometimes the fossil includes pollen that indicates what kinds of plants were existed. The family of pronghorn, the Antilocaprid, has lived only in North America and diversified into many sorts adapted to open prairie. Antilocaprids are closely related to sheep and bison rather than deer and moose. Although Pronghorns look like deer, they do not shed antlers annually like deer do. Yet they have permanent horns like goats do. 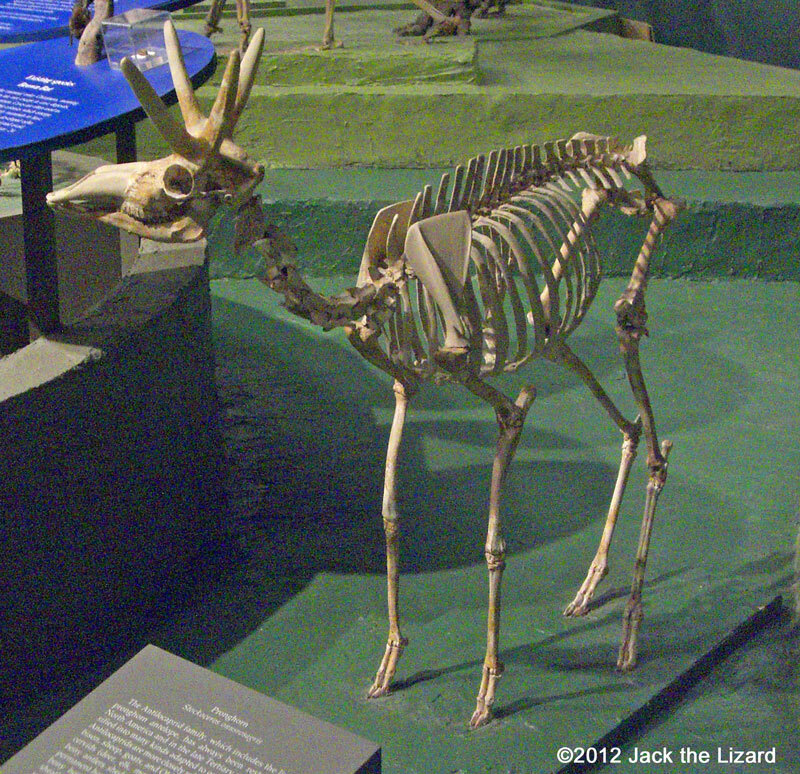 During the last million years ago Irish Elk started getting enormous size. 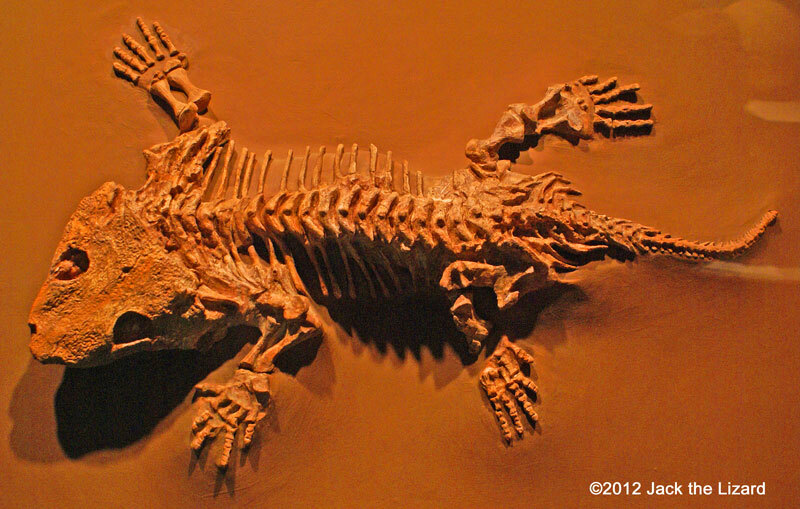 Although most of their fossils are found in Irish peat bogs, they inhabited from Eurasia to China and Siberia. They also spread out North Africa and moved into the Great Britain　through a land bridge during the Ice Age. 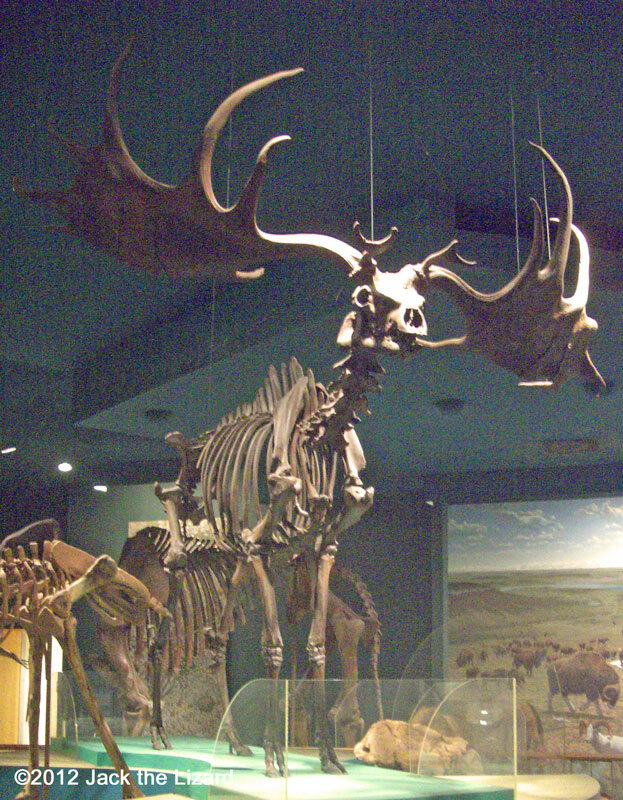 The huge antlers were grown and shed annually. They have gone extinct about 11,000 years ago. Dire wolves were larger than modern wolves, but slower and less intelligent. They hunted in packs like living wolves. Usually they tired their prey out in long distance pursuit. Although it is not known whether dire wolves interacted with humans or not, humans tamed dog－like animals for the first time by Upper Paleolithic about 8000 years ago. 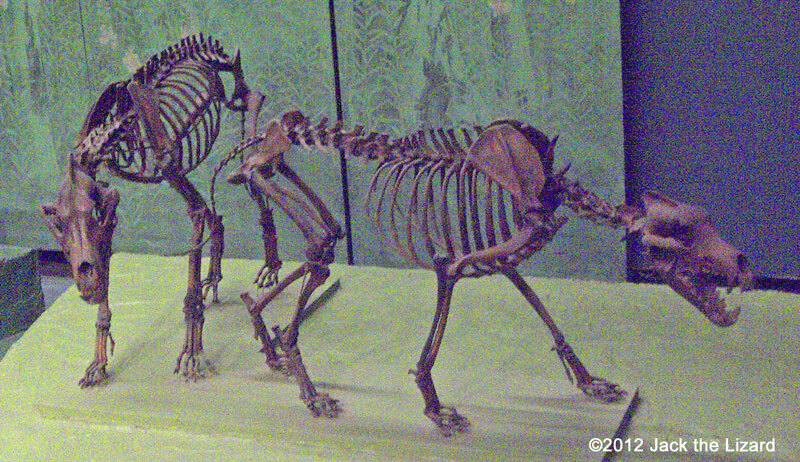 Dire wolves died out about 10,000 years ago. A numerous remain of Dire wolves are found in the tarpits, but North American Lions are not. This means that North American Lions were probably more cautious than Dire wolves not to be trapped in the tar. 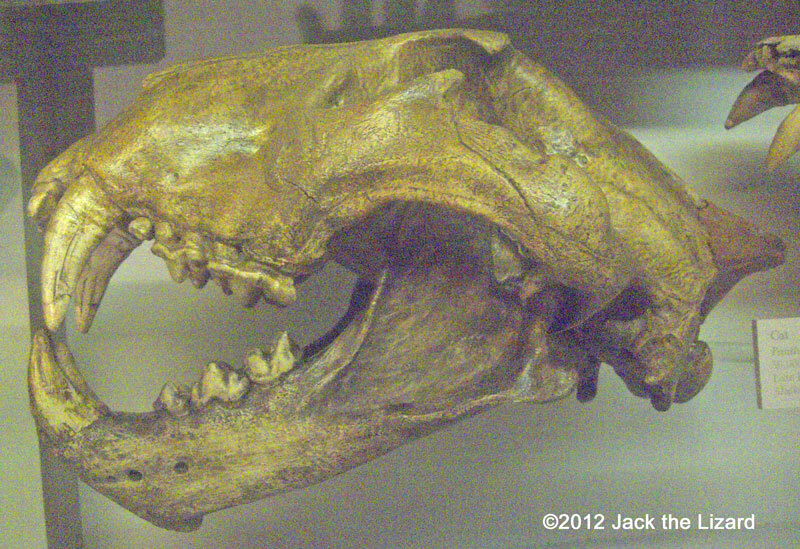 Dire wolves had relatively small brain as well. These evidences show the degree of the intelligence of Dire wolves.